In late February and early March we ran workshops in Melbourne and Sydney with Kevin Bishop from the UK. The workshops focussed on Influencing Change using Stories. Until recently, Kevin was heading the change activities for 60,000 staff at the Royal Bank of Scotland. We learned heaps and the feedback from participants was fantastic. The photo show the three of us (L to R: Shawn, Kevin, Mark) last Thursday at the LIW Centre for Leadership at Chowder Bay in Sydney. 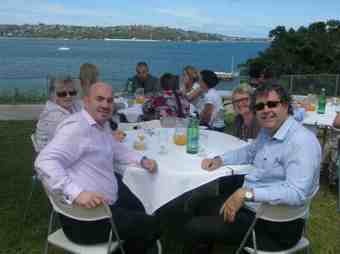 The photo below shows the group having lunch overlooking the harbour. You might as well do it in style! Our venue in Melbourne was also fantastic – the headquarters of Lifesaving Victoria right on Sandridge Beach in Port Melbourne.